Thought it'd be nice to put some faces to names & get to know each other a little better, especially with our new friends from across the pond! If I ain't on here you'll usually find me on StackOverflow or facebook waffling about something or nothing. I joined BUK when I was 18 years old (nearly 10 years ago!) I was VERY wet behind the ears when it came to our pointy friends but I was quickly enlightened by the legends of old (anyone remember Darksun?) who quickly dispelled the childish perceptions I had of swords at the time & so i grew to see them in a different light. I suppose I developed a new respect for them in a way - ended up reading a few books on tamahagane smithing & so on; & basically continued to read the stuff posted on these forums & learning as I went. 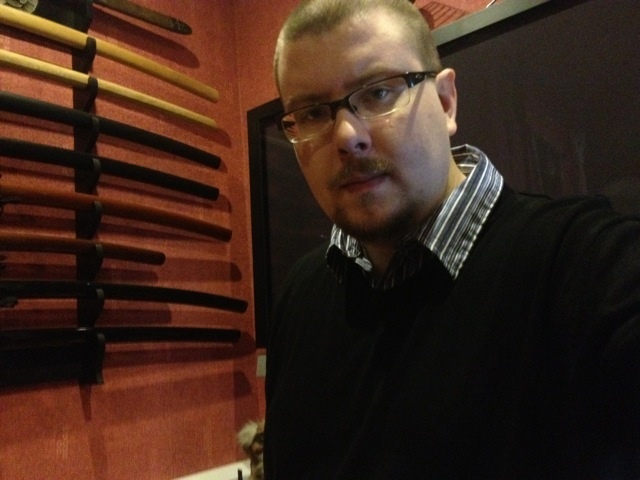 I tend to think of myself as a collector more than a practitioner these days (dabbled in tameshigiri for a few years and did some self taught iaido with friends in my early 20's but gave that up a few years ago) but I still find the martial arts an attractive subject even if I don't partake. Collection wise you can see some of my stuff here and here. as an infantryman upon completion transfered to the rct as a driver . Last edited by Geordie Ross on Fri Jan 11, 2013 1:10 am, edited 1 time in total. Indeed, ive added you now anyways geordie so best to edit your post. No i didnt, tbh i keep trying to give it away as i dont like it but no bugger is taking it lol - just sat in spare room now collecting dust. Still live the Cold Steel one though. the blade master wrote: Yes i was in the army did training just up the road from you at preston fullwood barracks to be exact the loyals in the lancasterian brigade as an infantryman upon completion transferred to the rct as a driver . /Salute sir! How long where you in the army if you don't mind me asking? I can give a vague description of mick as I've met him, he's around 28 years old, and has had transgender surgery, his hair is now long and blonde but he insists on having a beard to match his breast implants. lol Larny - not the scariest image you've ever posted - had trouble adding you on facebook so i've sent you a message on there instead so you can add me. Last edited by Geordie Ross on Fri Jan 11, 2013 4:19 pm, edited 1 time in total. Well I may as well divulge a little about myself, but as I hate photos of myself & the only ones I have are from my wedding, I'll omit one for now. I'm 46, 'medically retired' as one doctor quaintly put it, I have lived in Leicester my entire life & I have always had an interest in weaponry since I was a child. I started my small collection about 18 months ago, everything in it is what you may call a 'budget' purchase, I have also passed the 'collecting bug' to my Wife who has a slightly smaller collection than my self.